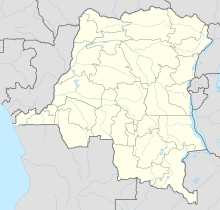 Mbandaka Airport (French: Aéroport de Mbandaka) (IATA: MDK, ICAO: FZEA) is an airport serving the Congo River port of Mbandaka, capital city of the Équateur District in the Democratic Republic of the Congo. The runway is on the southeast side of the city. The airport resides at an elevation of 1,040 feet (317 m) above mean sea level. It has one runway designated 18/36 with an asphalt surface measuring 2,202 by 45 metres (7,224 ft × 148 ft). The Mbandaka VOR/DME (Ident: MBA) is located 0.6 nautical miles (1.1 km) off the approach threshold of Runway 18. ^ Airport information for Mbandaka Airport at Great Circle Mapper. ^ "Mbandaka VOR-DME (MBA) @ OurAirports". ourairports.com. Retrieved 2018-08-20. ^ "Maps". www.bing.com. Retrieved 2018-08-20. This article about an airport in the Democratic Republic of the Congo is a stub. You can help Wikipedia by expanding it. This page was last edited on 20 September 2018, at 15:23 (UTC).